Many of us do care about the planet we live in. One way we can help is by home composting. This is an environmentally friendly way of dealing with garden and kitchen waste (not cooked food). 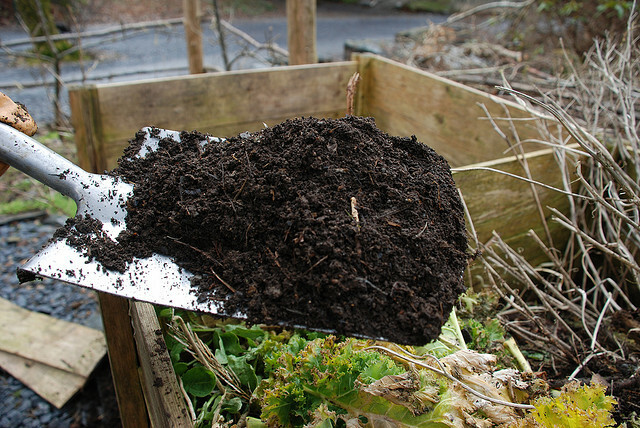 Composting is a biochemical process where naturally occurring microorganisms help to break down organic matter, producing what we know as garden compost. Adding this to your garden soil will improve the texture and quality of your soil, increase fertility, help conserve moisture and improve the plant growth. Local waste amenity centers sell a selection of composting bins. Use a bin to compost your waste organic matter. This will help to insulate the heap. The heat helps to accelerate the decomposition process. Position your bin on bare earth, allowing drainage and soil organism access to the organic matter. Make sure that the bin has a lid. This will help prevent the compost heap from drying out and maintains moisture within the heap. Do not put diseased plants, perennial weeds, seed heads, cat & dog waste, plants recently treated with herbicides, meat, fish and cooked food scraps into the composting bin. In order for the composting process to work efficiently it requires a balanced supply of water, oxygen and good mix of organic matter. The heap should have a good mix of wood chippings and carbon rich waste such as woody prunings. These will decompose quicker if they have been shredded. Shredded paper will help to absorb the decomposing smell. Dead leaves can also be added. Grass clippings, kitchen vegetable waste and manure will help add nitrogen to the compost. There are acceler.ators on the market that can be added to your compost heap to further speed up the process of composting. As an alternative a bucket of farmyard manure can be added to every 15cm layer of compost. Start doing your bit for the planet today and get composting. Your garden will thank you for it.